Remember, there is no such thing as waterproof leather. 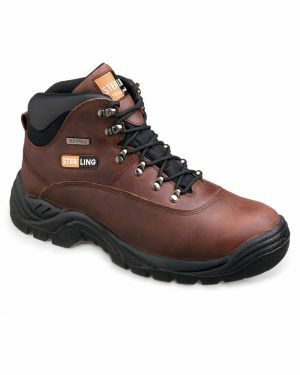 These leather waterproof safety boots from Sterling Steel are S5 rated; accordingly, this means that they have a complete waterproof liner inbetween the leather outer and the inner lining to totally stop water ingression. 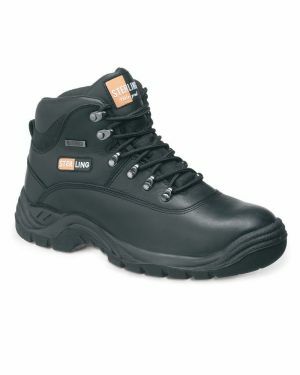 Furthermore, to allow for higher levels of water (deeper water) Sterling steel waterproof safety boots have designed the boot tongue to be joined to the boot higher up than standard safety boots. When it comes to value for money, please compare Sterling to other well known brands and you will be pleased to notice they are less than half the price with the same features , there is no compromise on comfort, quality or safety here either. They are lightweight flexible and very cofortable from day one. The manufacturers of Sterling Steel waterproof safety boots spend there development money on the product NOT marketing of their name like CAT, Timberland etc etc. So YOUR hard earned cash is spent on the product and NOT lining the pockets of the owners of mass marketed branding. Sterling Steel waterproof safety boots are fully compliant with EN ISO 20345 as required here in the united kingdom.